Whether you love to write or just endure it, it’s a good time to embrace a content marketing strategy. Do you love to write, and the words flow like water in a stream? My guess is probably not! If you’re like most people, when it’s time to write, you need to shut your office door, knuckle down, and just get it done. Yet no matter your approach to writing, you’re in luck. Why? Because producing content is the absolute key to “content marketing,” an effective marketing strategy that continues to gain traction. Content marketing is truly enjoying its day in the sun! In fact, the Content Marketing Institute says: “It’s the present – and future – of marketing.” In other words, it’s the better way, and it’s here to stay. 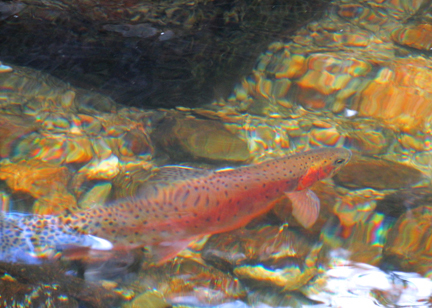 Content marketing is like “going fishing” for prospects. In very simple terms, you bait the hook, stay attentive, and reel them in. 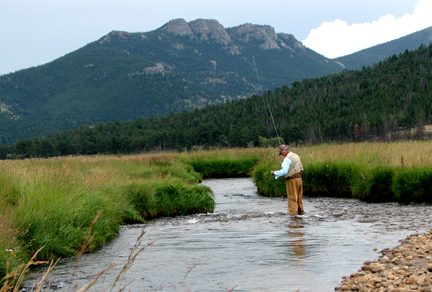 Photo of fisherman at Fall River, Rocky Mountain National Park by Patrice Rhoades-Baum. Put more simply: When you regularly create and distribute useful content, you can attract prospects, nurture a relationship, and drive sales. Even if you only do a tad bit of marketing in your business, you know that writing content is part and parcel to implementing all types of marketing, public relations, and advertising strategies. Working with different clients in different industries has given me insight into the many ways to pursue content marketing. Some strategies are fairly simple; some are quite robust. The end goal is the same: attract prospects, nurture a relationship, and drive sales. Whether your business is large or small, I believe there are 3 basic steps for your content marketing plan. In a nutshell, these are: (1) Write regular blog posts to attract prospects to your website. (2) Entice them with a compelling giveaway, so you can get their email address and build your list. (3) Send regular email newsletters to your list to stay top-of-mind, nurture the relationship and, over time, convert prospects to paying clients. Keep reading … here are details for this basic, 3-step plan. Follow these tips to begin (or improve) your content marketing strategy. 1. BLOG ARTICLES – Post regular blog articles with information that is useful, relevant, and informative for your target market. Although your blog articles clearly show your expertise, they are not sales pitches. The reason to post new content regularly is two-fold: You are inviting and attracting prospects, customers, and social media connections to visit your website. Plus, adding new content invites Google’s search-engine robots to revisit your site, which can help to improve your search-engine rankings. Include SEO keywords in every blog post, which helps to attract prospects to your blog and website. Identifying organic SEO keywords is simple. Here’s a quick case study: I just began teaming with an accomplished executive coach and his assistant. We quickly identified these organic SEO keywords: his full name (not just his first name) and his city as well as phrases such as executive coach, business coach, executive coaching, Vistage Chair, and so on. In terms of word count, Google likes 300+ words. Use a plugin (e.g., Yoast), which can guide you to improve your search-engine optimization, with the addition of a keyword focus, meta description, and more. Use your social media sites to announce the new article to your fans, friends, and followers. This invites folks to your website/blog to read the article. I like to include brief blog articles with photos on topics of personal interest. Examples include highlights of hiking adventures, archaeological field trips, and roadtrips throughout the Southwest. This has been a fun and rewarding way to truly connect with many like-minded people around the world. 2. OPT-IN BOX – Ensure your blog has an opt-in box in the margin, so you can capture visitors’ email addresses. The opt-in box must have a compelling, free giveaway item (aka lead magnet, opt-in bribe, or freemium). Here’s the reason to create a hardworking opt-in box: This simple tool helps to build your list. This enables you to stay in contact with prospects and grow your relationship. You can have one main opt-in box in the margin of your blog. Better yet, each blog article can have a brief corresponding worksheet that is downloadable via that particular blog article’s opt-in box. Place an opt-in box on all pages of your website, not just on the blog and Home page. In fact, consider having opt-in boxes with different giveaway items on various web pages to entice prospects who are interested in your various products and services. Ideally, when someone opts-in, they should receive several autoresponder emails that offer additional, valuable information. This helps to create a trusting relationship. Keep the focus on giving value rather than sell-sell-sell. In the opt-in box, consider asking for ONLY the email address – not first name, last name, city, company, and other information. Marketing data shows that conversion rates improve when less information is required. Ask your assistant or website developer to ensure the email address is automatically entered into your email newsletter database (e.g., MailChimp or Constant Contact). 3. EMAIL NEWSLETTER – Send a weekly or monthly email newsletter. The primary reason is to stay top-of-mind with your prospects and customers. Ideally, many prospects will eventually convert to paying clients. Plus, many clients will return to purchase your products and services. Primarily, the content should add value, not sell. You can certainly promote new products, services, special offers, and so forth. And, of course, you can include links to your website. Consider creating an editorial calendar. This step can help you develop more sophisticated email campaigns to support your product funnel and drive the sales process. All the above steps assume that the website content is up-to-date, particularly when it comes to brand messaging, products, services, and case studies. In fact, I encourage you to keep your website content as current as possible. (If you need help, give me a holler.) Your up-to-date website is the hub of all marketing activities. Follow this basic 3-step content marketing strategy to attract prospects, nurture the relationship, and drive sales.